In 1976, Barry Benepe chose Union Square Park, which dated to 1831 and had fallen into extreme disrepair, as the site for his second greenmarket. Benepe, an architect and planner, started the Greenmarket program in 1975 with an $800 grant from the America the Beautiful Fund to demonstrate how temporary markets could bring life to streets and create community gathering places on empty lots and underused parks. 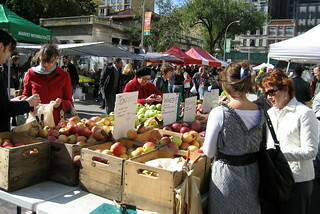 The program now sponsors farmers markets in more than 30 neighborhoods across all five boroughs. The Greenmarket prompted activity around the park, drawing residents who wanted to buy fresh produce trucked in from farms throughout the region. In the 1980's, the market's popularity led to a multimillion-dollar renovation of Union Square and revitalized the neighborhood. The market now draws tens of thousands of people a year.